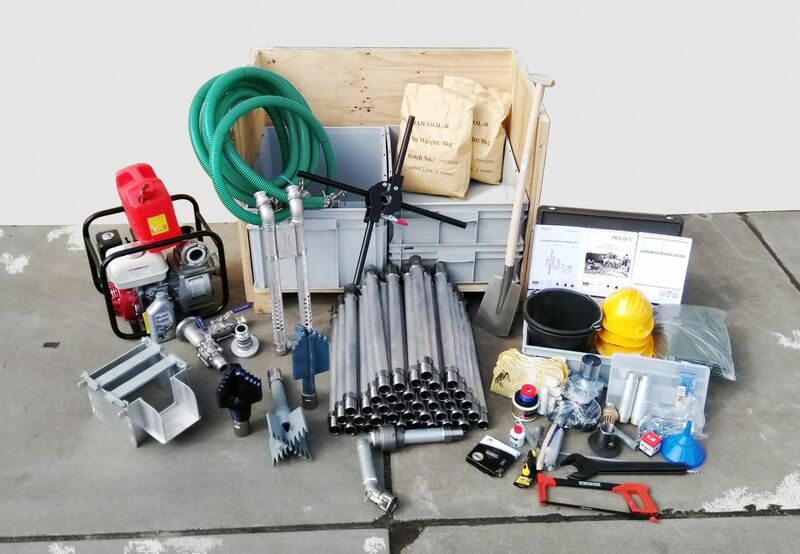 Kit to enable manual borehole drilling by rotary jetting method. The kit is an upgraded version of a rotary jetting kit used by local enterprises in Africa. It has been adapted to be more suitable in emergency settings and uses high quality components for increased reliability and longevity. This equipment is designed to enable a small team to drill up to 30 m deep in soft sediments. Drill bit is 7" which will enable a casing of 5" to be installed with gravel pack. Equipment is developed and supplied by the Practica Foundation. Practica are able to offer in-country training, manual drilling suitability maps (for many countries), and other documentation for NGOs that are setting up manual drilling programmes/teams. Manual well drilling is a proven borehole construction method in the developmental context. Drilling water wells by hand using local enterprises, can reduce the cost of a water point to 10-50% of the cost of a machine-drilled borehole. The drilling method uses manpower rather than machine based power to penetrate geological formations. The installation and finalization processes are identical to machine drilling and with skilled operators a similar quality can be obtained. It is well known for its simplicity, ease of transport, their independence of external supplies and cost effectiveness. Suitability: Rotary jetting is best suited for drilling through unconsolidated formations that consist of loose sand, silt, clay or thin layers of small size gravel. Certain highly weathered consolidated formations can be penetrated as well. The kit cannot be used for drilling in hard formations/bedrock of any type. If such formations are encountered, re-siting is needed. A water supply is required. A transport/trucking bladder should be used. Polymer is supplied for initial start up (2-3 holes), a local source of consumables and bore hole materials must be found. 8 1 Each Drill bit, 7"
11 1 Each Non-return valve, 1½"